We investigated how a team of robots in a stressful situation like search and rescue can support their human partners more holistically. Research in human-robot teamwork typically focuses on developing autonomous robots that only interact with people to coordinate with them or to establish common ground. However, going beyond improving team functioning, how can a robot help people in these high-stakes situations in a social-emotional way? Our humanoid robots use subtle affective cues to express that they were engaged and attentive to their human teammates. In a complex search and retrieval game, players that were partnered with these type of robots felt less stressed out and were also observed to be less cognitively loaded. We developed a system architecture to support two autonomous humanoid robots playing this game with a human player. The robots are capable of recognizing human commands, responding back using synthesized speech, searching and navigating the game arena, maintaining game state, and performing pick-and-place operations to grab baskets. 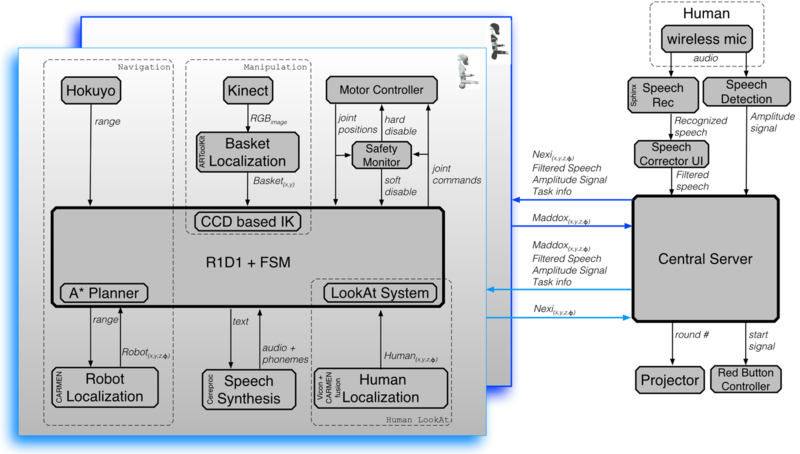 System diagram illustrating tech modules for the autonomous robots, human speech processing, and game play.